Truth is where you find it, right? When I saw this photo it stopped me cold. 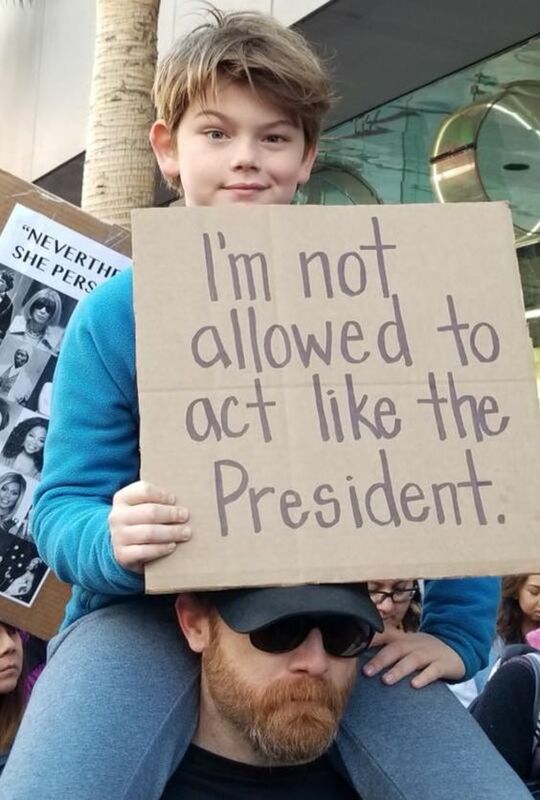 I would not ever allow a child or a grandchild of mine say the things or act the way the Liar-in-Chief speaks and acts. I am confounded that a third of our country sees the man as a leader and a good role model. His gross immorality and blatant lack of ethical behavior is abhorrent. Yet, numerous white evangelical leaders continue to choose him over the message of the Gospel. Tomorrow night is the State of the Union Address. For the first time in history we need to make sure we protect our children from watching. This entry was posted in News & Views, Quotes and tagged act, BLOTUS, children, ethic, freedom, gospel, immorality, knowledge, leader, leadership, Liar-In-Chief, parenting, President, protect, role model, State of the Union Address, truth, white evangelicals on January 28, 2018 by Ray Buchanan. In his 1941 State of the Union Address, President Franklin Roosevelt talked about a future world where global security would be built on a foundation of four essential human freedoms. The first was freedom of speech and expression. The second freedom enunciated by Roosevelt was the freedom of every person to worship God in their own way. The third is freedom from want–which, translated into world terms, mean economic understanding which will secure to every nation a healthy peacetime life for its inhabitants everywhere in the world. The fourth freedom Roosevelt talked about was the freedom from fear, which he insisted meant a worldwide reduction in armaments, a reduction “to such a point and in such a thorough fashion” that no nation would be in a position to commit physical aggression against any neighbor. We are certainly a long way from the future envisioned by Roosevelt. Yet his premise of a world founded on four basic freedoms has a power to it that cannot be denied. Today, when we have enough food to feed all of us on the blessed planet we call home, we need to recognize that freedom from hunger is a basic right of every person in the world. Then we need to join together in a massive global movement to ensure that all of us enjoy that freedom. Working together we can make it happen. This entry was posted in Hunger & Poverty, Quotes and tagged armaments, fear, food, freedom, global security, merchandise, money, Roosevelt, State of the Union Address on February 25, 2015 by Ray Buchanan.